Rovio hints at sending our feathered friends to a galaxy far, far away. Angry Birds Star Wars. Star Wars Angry Birds. Whatever you want to call it, there appears to be some licensing agreement going on between Rovio and George Lucas' empire. 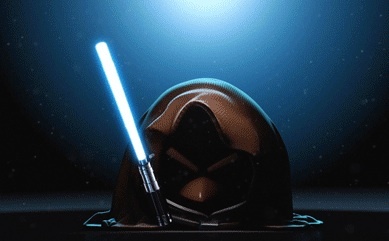 In fact, Rovio said as much on the Angry Birds Tumblr page, where it hints at a Star Wars tie-in of some sort. A bird in Jedi robes brandishing a lightsaber? Call us intrigued. That said, you can expect some sort of announcement this Monday, October 8, in Times Square NYC at 10AM ET. Rovio also, as a hint, suggests attendees arrive at 8AM ET. Keep in mind this may have nothing to do with a video game per se, but comics, animated series and toys. Either way, this could be cool.